Look closely, and you'll see the brown leaf edges that are indicative of heat stress. 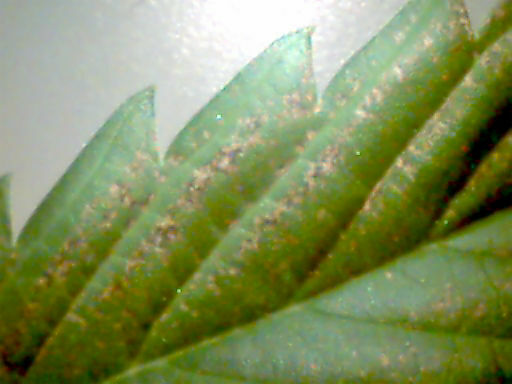 This damage looks alot like nutrient burn, except it occurs only at the tops of the plants closest to the lamps. There's only one cure for this...get the heat away from the plants, either by moving the lamps or moving the plants. 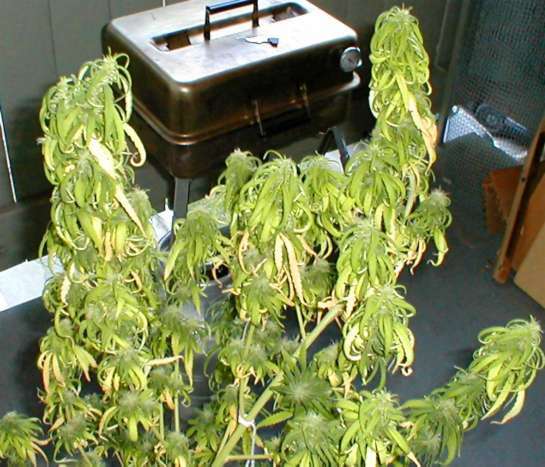 There's a good chance that this bud was subjected to nutrient solution burn. 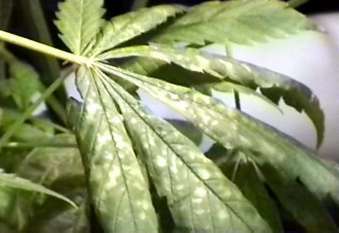 These symptoms are seen when the EC concentration of hydroponic solutions is too high. 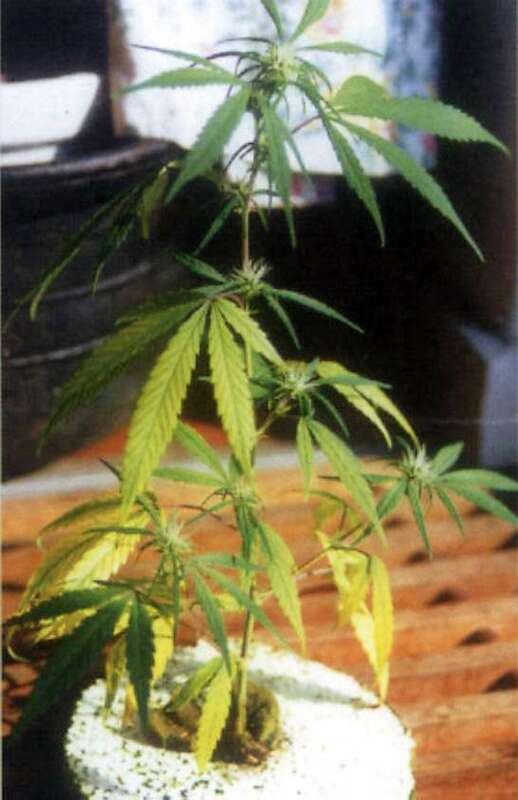 These symptoms also appear when strong nutrient solution is splashed onto the leaves under hot HID lamps, causing the leaves to burn under the solution. Many hydroponic gardeners see this problem. It's the beginning of nutriet burn. 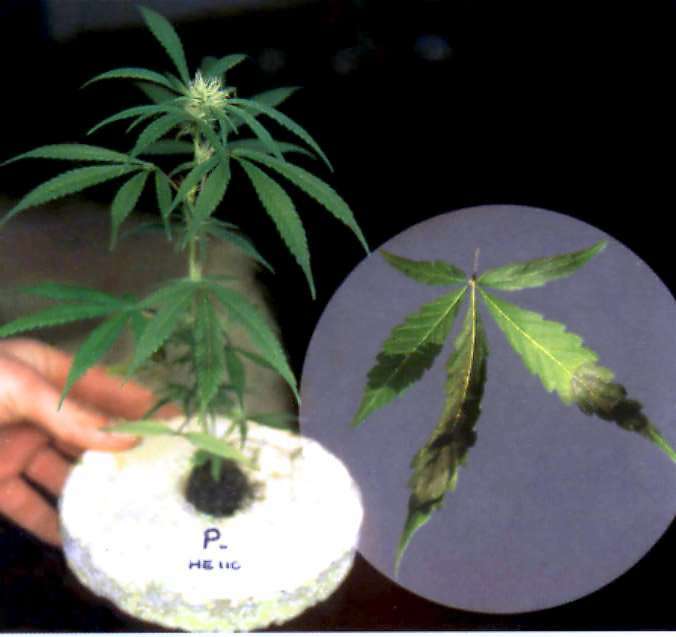 It indicates that the plants have all the nutrients they can possibly use, and there's a slight excess. Back off the concentration of the nutrient solution just a touch, and the problem should disappear. Note that if the plants never get any worse than this here, then the plants are probably just fine. Figure 4 is definitely an over-fert problem. 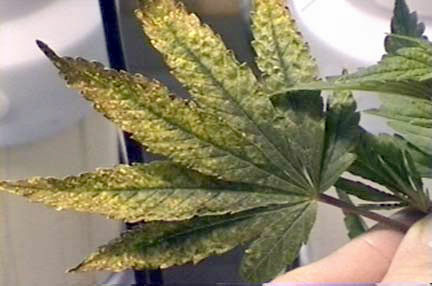 The high level of nutrients accumulates in the leaves and causes them to dry out and burn up as shown here. You must flush with clear, clean water immediately to allow the roots to recover, and prevent further damage. The find the cause of the high nutrient levels. 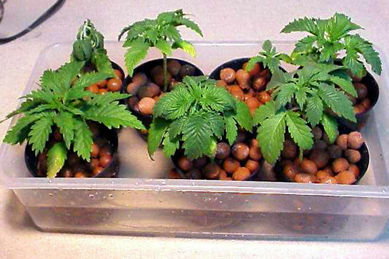 The plants in Figure 1 were on a continous drip system, where nutrient solution is constantly being pumped into the medium. This tends to keep the entire root system completely saturated. A better way would be to periodically feed the plants, say for 1/2 hour every 2-3 hours. This would give the roots a chance to get needed air to them, and prevent root rot and other problems. 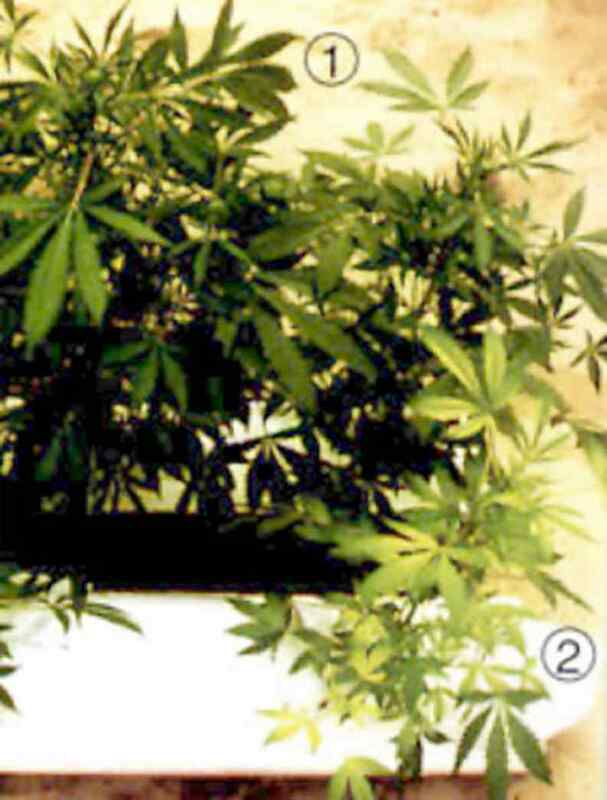 Don't be throw off by the fact that the plants in Figure 2 are sitting in still water, this is actually an H2O2 solution used to try and correct the problem. Adding an airstone to the tub would also help add O2 to the solution. Both of these leaves in figure 3 and figure 4 are from the same plant. It could be over fertilization, but more likely it is due to the pH being off. 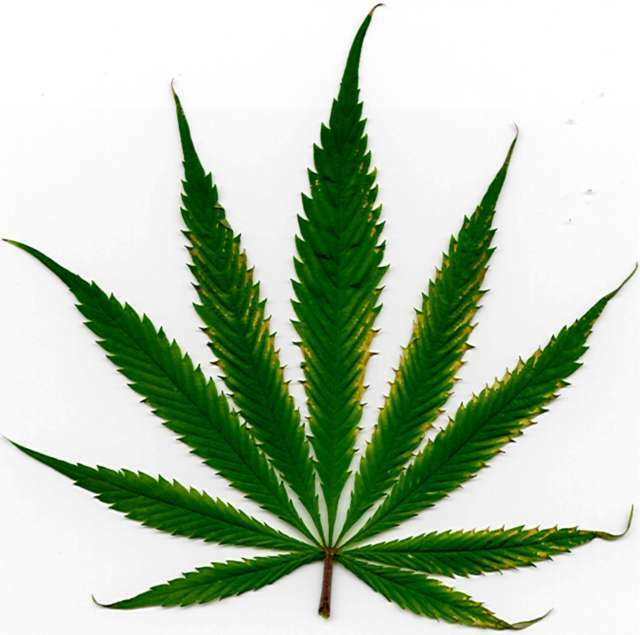 Too high or too low a pH can lock up nutrients in the form of undisolvable salts and compounds, some of which are actually toxic to the plants. 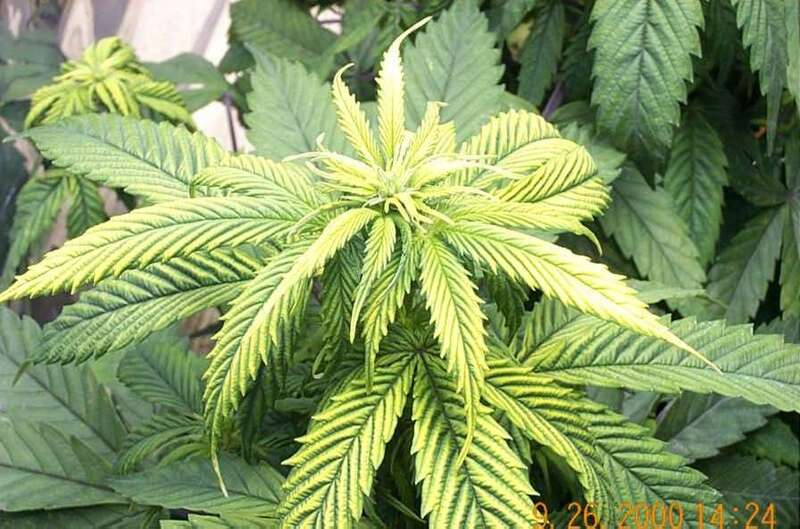 What then happens is the grower then tries to supplement the plants diet by adding more fertilizers, throwing off the pH even more and locking up even more nutrients. This type of problem is seen more often in soil mixes, where inconsistent mixing of the medium's components leads to "hot" spots. Potassium is involved in maintaining the water status of the plant and the tugor pressure of it's cells and the opening and closing of the stomata. Potassium is required in the accumulation and translocation of carbohydrates. Lack of potassium will reduce yield and quality. 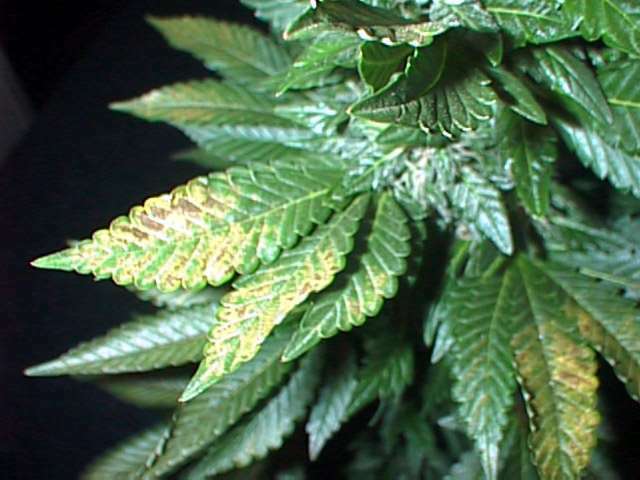 Older leaves are initially chlorotic but soon develop dark necrotic lesions (dead tissue). First apparent on the tips and margins of the leaves. Stem and branches may become weak and easily broken, the plant may also stretch. 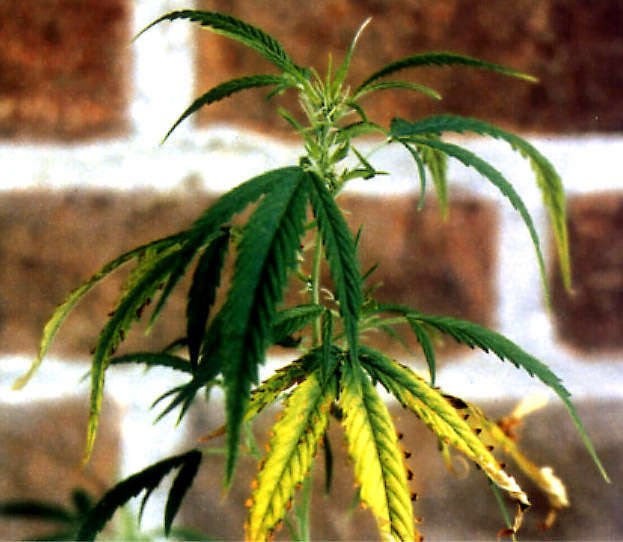 The plant will become susceptible to disease and toxicity. 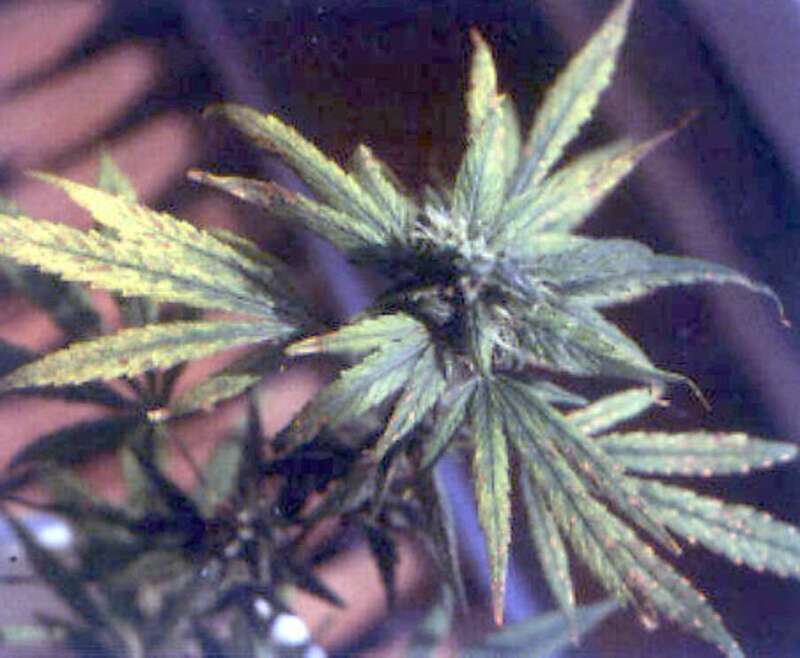 In addition to appearing to look like iron deficiency, the tips of the leaves curl and the edges burn and die. This can be quickly resolved by watering with 1 tablespoon Epsom salts/gallon of water. Until you can correct nutrient lockout, try foliar feeding. That way the plants get all the nitrogen and Mg they need. The plants can be foliar feed at ½ teaspoon/quart of Epsom salts (first powdered and dissolved in some hot water). When mixing up soil, use 2 teaspoon dolomite lime per gallon of soil. Also gets locked out due to high pH. Zn, Fe, and Mn deficiencies often occur together, and are usually from a high pH. Don't overdo the micro-nutrients- lower the pH if that's the problem so the nutrients become available. Foliar feed if the plant looks real bad. Use chelated zinc. 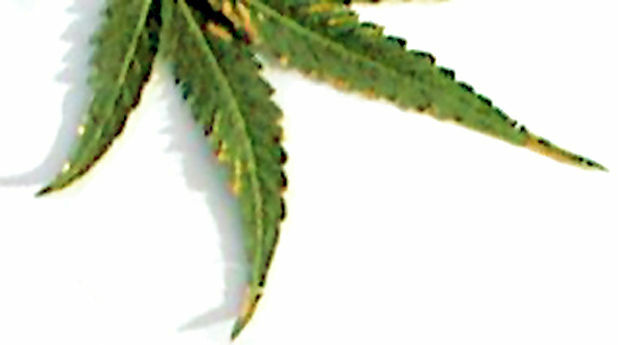 Zinc deficiency produces "little leaf" in many species, especially woody ones; the younger leaves are distinctly smaller than normal. Zinc defeciency may also produce "rosetting"; the stem fails to elongate behind the growing tip, so that the terminal leaves become tightly bunched. 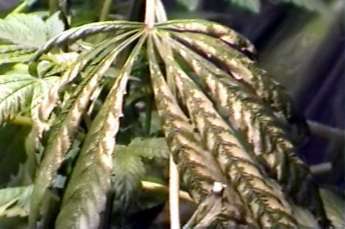 Young leaves are affected first and become small and distorted or chlorotic with irregular margins, spotting or necrotic areas. 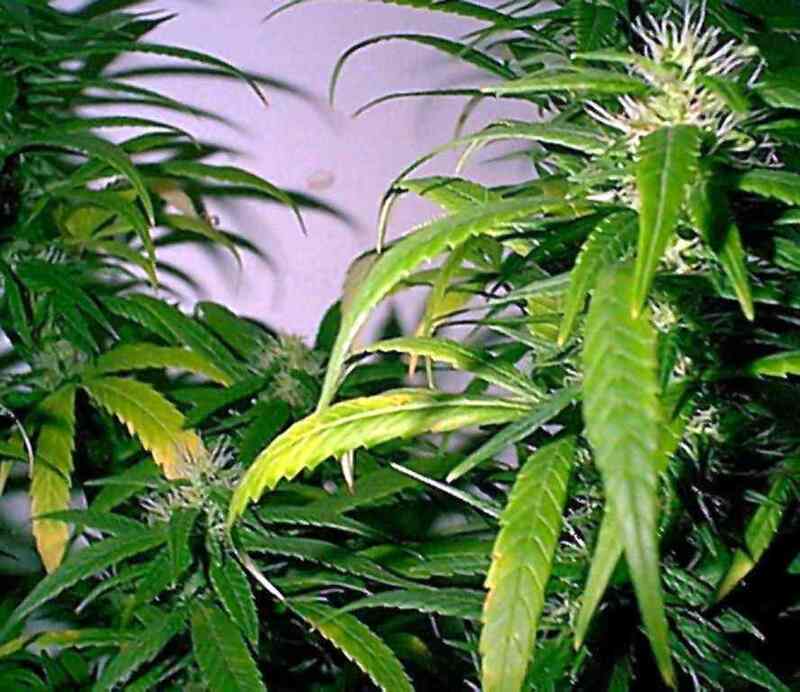 Bud development is inhibited, blossom end rot and internal decay may also occur and root may be under developed or die back. 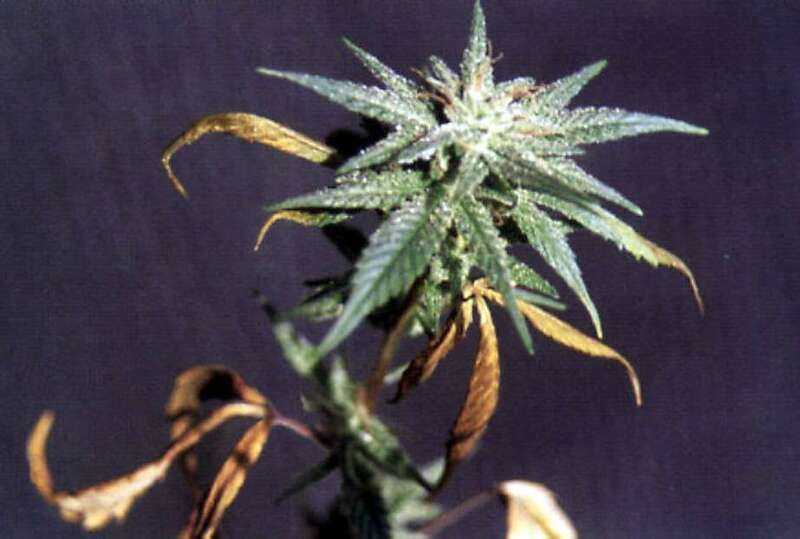 Deficiency will cause root tip die-back, leaf tip curl and marginal necrosis and chlorosis primarily in younger leaves. 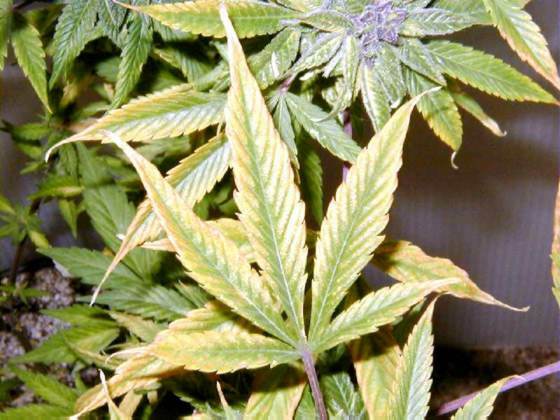 Symptoms: young leaves develop chlorosis and distortion such as crinkling, dwarfing, developing a strap-like shape, shoots stop growing and thicken. Pronounced interveinal chlorosis similar to that caused by magnesium deficiency but on the younger leaves. 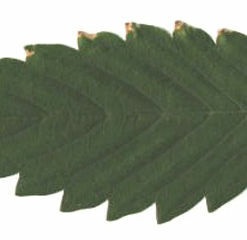 Leaves exhibit chlorosis (yellowing) of the leaves mainly between the veins, starting with the lower and middle leaves. Note that when adding iron to the solution, it is often necessary to not use fertilizer for that watering. Iron has a tendency of reacting with many of the components of fertilizer solutions, and will cause nutrient lockup to occur. Read the labels of both the iron supplement and the fertilizer you are using before you attempt to combine the two. Mn gets locked out when the pH is too high, and when there's too much iron. Use chelated Mn.